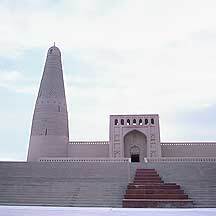 苏公塔Sugong Ta, also known as 额敏塔Emin Minaret, is the tallest minaret (an Islamic tower, usually attach to a mosque) in China. 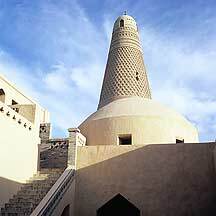 It is a circular tower that tapers as it rises 44 meters high. 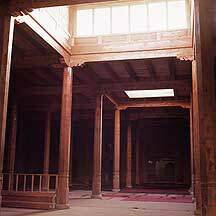 While wood can be found inside, the bulk of the structure was layered and decorated with sun-baked mud-bricks. 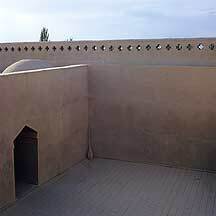 A center post of stacked bricks rises from the base to the top, and winding around it is a 72-step staircase that leads to the top; at intervals light breaks in through 14 very narrow windows. 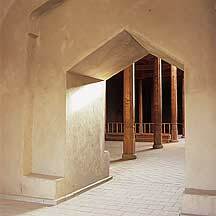 Besides the minaret is an active mosque, which has a large interior praying hall. 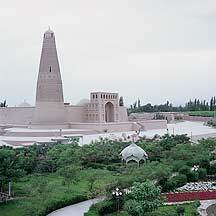 In the back and on the minaret's side is an active cemetery. 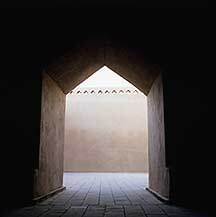 Like many tall and symbolic structures, the minaret's purpose is to act as a converging point. 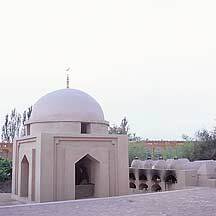 The site is not far from the 吐鲁番市Tulufan city center, about 2 kilometer away in a grapevined village called 木纳村Munacun. I took the city bus there and because the village is quite interesting, I walked much of the way back. Like many of the roads in Tulufan, it was lined with poplar trees, so it felt very nice. 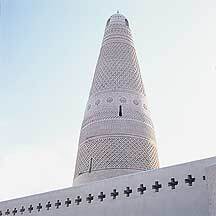 The large tower, called the minaret, is the main piece in the site, but to preserve the structure no one is allowed to go up. 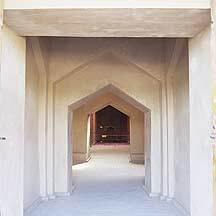 Entrance to the mosque part of the complex. The building is likely a recent addition. 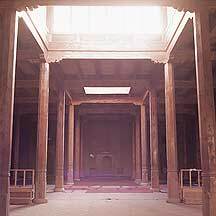 The praying area of the mosque. 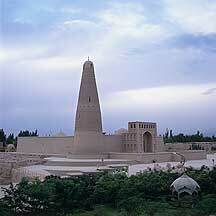 The moslem cemetery filled the side of the tower and extended all the way behind the complex. 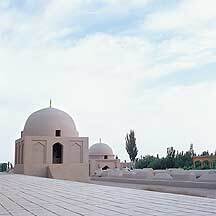 The cemetery is in active use. 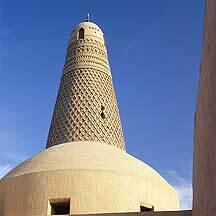 On the end side of the distinctly moslem gravestone, a long cylindrical body with a petal shape profile, is an area for burning materials. I don't know what was being burnt. 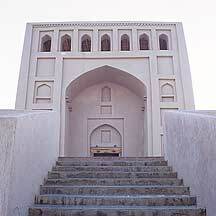 The entrance area to the tower. The road was lined with vendors, most of them sell their famous raisins. 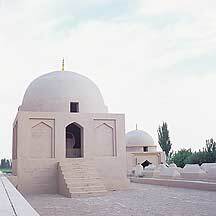 1.Much of the data for the Sugong Ta minaret and its history are derived from 百度百科Baidu Baike's article of the same subject. 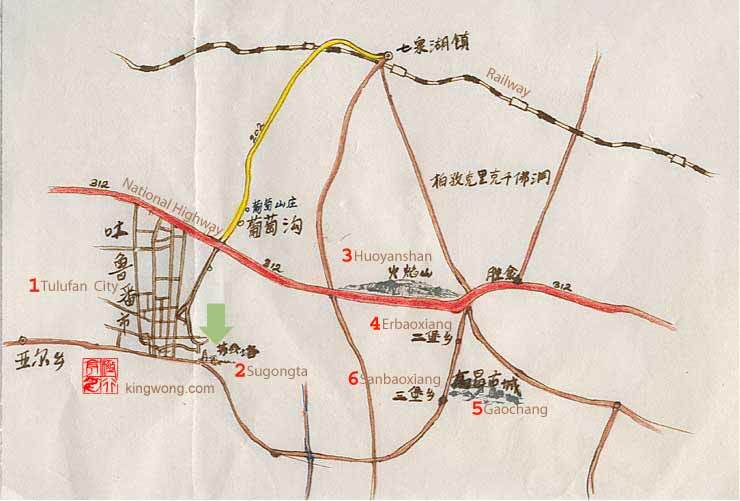 苏公塔Sugong Ta is about 2 kilometers east of 吐鲁番市Tulufan City center. Take the city bus #102 路lu (road) (Y.5 morning, Y1 evening) to Sugong Ta stop. 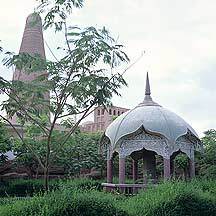 The tower is not far to the right through a short road.